Hinds County Circuit Judge Winston Kidd of Jackson and Rep. Angela Cockerham of Magnolia have been appointed to the State Drug Courts Advisory Committee. Supreme Court Chief Justice Bill Waller Jr. made the appointments in an order filed Jan. 5. 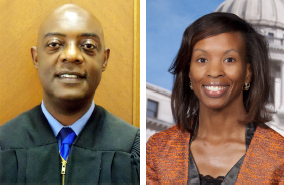 Chief Justice Waller also reappointed Circuit Judge Michael M. Taylor of Brookhaven; Melody Winston of Madison, director of the Department of Mental Health Bureau of Alcohol and Drug Services; and Christy M. Gutherz of Jackson, Department of Corrections deputy commissioner of Community Corrections. The appointees’ terms run through December 31, 2019. Members serve staggered terms. Administrative Office of Courts Director Kevin Lackey of Ridgeland is chairman. Other members are Justice Robert P. Chamberlin of Hernando, Circuit Judge Robert Helfrich of Hattiesburg, Circuit Judge Charles E. Webster of Clarksdale, Harrison County and Youth Court Judge Margaret Alfonso of Gulfport, and Rankin County and Youth Court Judge Thomas H. Broome of Brandon. Judge Kidd took the Advisory Committee position previously held by James Maccarone of Jackson, director of the Division of Youth Services of the Mississippi Department of Human Services. Rep. Cockerham replaced former Sen. Sean Tindell of Gulfport on the Advisory Committee. Tindell was appointed to the Court of Appeals in October 2017. Judge Kidd is chairman of the Conference of Circuit Judges. He has supervised the Hinds Circuit Drug Court for the past seven years. He has served as a circuit judge since November 2001. Rep. Cockerham, an attorney, began her service in the Mississippi House of Representatives in 2006. She is chair of the House Energy Committee and vice-chair of the Management Committee. She serves on legislative committees including Apportionment and Elections; Appropriations; Compilation, Revision and Publication; Ethics; Judiciary A; Judiciary En Banc; Legislative Budget Committee; Performance Based Budgeting; and Wildlife, Fisheries and Parks. The State Drug Courts Advisory Committee was established by the Mississippi Legislature in 2003 to recommend improvements to drug court policies and procedures. The Advisory Committee was also responsible for developing statewide evaluation plans and models for monitoring critical aspects of drug court operations. Drug courts seek to rehabilitate drug-using offenders through drug treatment and intense supervision with drug testing and frequent court appearances. Drug courts offer the incentive of a chance to remain out of jail, and the sanction of a jail sentence if participants fail to remain drug-free and in compliance with all program requirements.